First are making major changes to their 3 service which is currently City Centre to Barne Barton. Service 3 (City Centre - St Budeaux): The frequency of buses on this route is being reduced slightly. From the end of October buses will run every 10 minutes Monday - Saturday. In addition to this the route is being adjusted with all Service 3 buses set to terminate at St Budeaux from this date. The “adjustment” is the removal of the red section seen below! As First state: The changes to Service 3 mean that people wishing to travel to and from Barne Barton by bus will need to make alternative arrangements. Although anyone with a First season ticket might be annoyed most passengers will be able to find an alternative as Plymouth Citybus 21 runs the same route every ten minutes. So what extra are First giving us to make up for this loss? Now this does look like a good route which should be popular as it opens up new links and with decent marketing might be a good move by First. It seems a shame then that its not being set up a as straight forward circular service with all buses doing the whole route. If you catch a 3 at Devonport towards St Budeaux how do you know if it continues on towards Honicknowle or just turns at St Budeaux? Hopefully this will be shown on the bus somehow and not just all show St Budeaux as the destination. The 3A is up against Plymouth Citybus 61 62 from Honicknowle into the City Centre. We see the 3A below (purple) with the 61 (red) and the 62 (orange) which bother operate every half hour. I am sure there will be a few passengers along the common sections who will be grateful for First for the extra service. Additionally, most journeys on Service 2 will continue from Royal Parade as Service 3, thus providing links from Plymstock to Devonport and St Budeaux. This is yet another example of the current fad for cross city services being introduced half heartedly. If you agree that cross city services are the way forward (and many argue that it isnt!) then at least try to make it clear to passengers that this is the case. Plymouth Citybus have finally taken the bull by the horns with the 21 21A and also the new 5 5A in that the services are being marketed as one through service rather than vague promises that most buses go through. It should be easy to work out as both the 2 and the 3 are every 10 minutes so all buses will just go through? We can see that the Oreston runs take an extra couple of mins so the buses do not arrive on Royal Parade on a nice 10 minute frequency. So what times do they then leave on the 3? Well that’s useless! if its every ten minutes then say so! Either way, it looks like every other bus arrives on a 2 two minutes after the 3 departs – so maybe its not so straight forward. This timetable from First also highlights the issue of the 3A being marketed properly. The 3A potentially opens up new links between Devonport and Honicknowle etc – but how would you know this looking at the 3 timetable shown above? There is no mention whatsoever that alternate buses continue as the 3A. It appears that the buses leaving RP at 10 30 and 50 mins are the ones which continue through after a 3 min break at St Budeaux. I have never been a fan of First’s online timetables as they are not the clearest or easiest to use. The PDF option is better but often the page layout is poor with timetables not formatted to the printed page. Their printed material is often better and their bus stop timetables are a lot better than used by Citybus. Indeed the printed timetable leaflet for the new service does indeed have a full timetable showing the full circle. Sadly I cant show it here properly as it comes out sideways in the PDF! Its a real shame that First cant put these timetables online instead of the current ones. They look a lot better, are a lot clearer and in this case show all the connections a lot better. Unlike the new 6 which I fail to see the point of, this new service has a lot of potential and opens up new travel opportunities. I really hope it works out and is given enough time to work. If they could just get a few more routes like this and some decent buses in Plymouth then the future would look a lot less uncertain than it has done for some time. Personally I think this is a great plan by First and certainly shows they have got people in charge there now ready for a fight with PCB. With good marketing.. including the adverts on Radio Plymouth etc this could be hugely successful and damage Citybus in these areas who for too long have treated West Park, Honicknowle and St Pancras etc with contempt, constantly changing timetables and cutting back. Firsts 20 min frequency against Citybus 30 min freq in many areas for eg will be popular with commuters especially as First are a lot cheaper too, Day/Week/Month tickets etc... will wait to see Firsts Single and return offerings too.. I suspect they will undercut Citybus for this too! 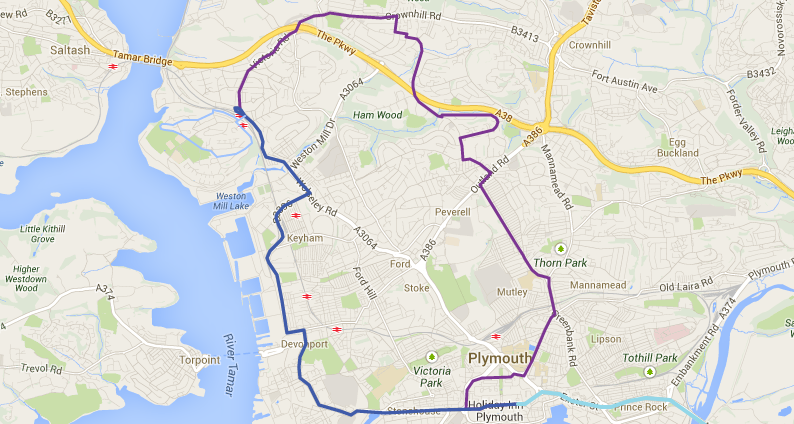 If I were First I would look at Southway/Tamerton next or perhaps a loop like 3A around the east of the city... how about City/ Mutley/Austin Farm/Leigham/Estover/Derriford back to City via Mutley, and one opposite way around.. this would take on 27 etc where citybus have cut and would also take on 50 through Leigham, Estover (replace 15 here) and increase presence on northern corridor? Just a thought? Southway would have been a better choice than Efford, it worked last time until First pulled it: coupled with Plympton (their old service12 route) with reliable SINGLE deckers that the old and bold can use safely. Maybe First managers don't read their competitors complaints or even bother to ask their drivers what might or might not work. Or maybe they have a plan that you don't know of or understand? Agree with anon 20.44 that would be very useful route. Re anon 10:55 totally agree with you, First were quite successful in Southway and to a degree Plympton in 2009/2010. This time they seem really up for a fight with PCB and if Efford/Honicknowle etc goes well, I think Southway could be on their radar for 2014, either another new route or in place of Efford 6, if not going well. 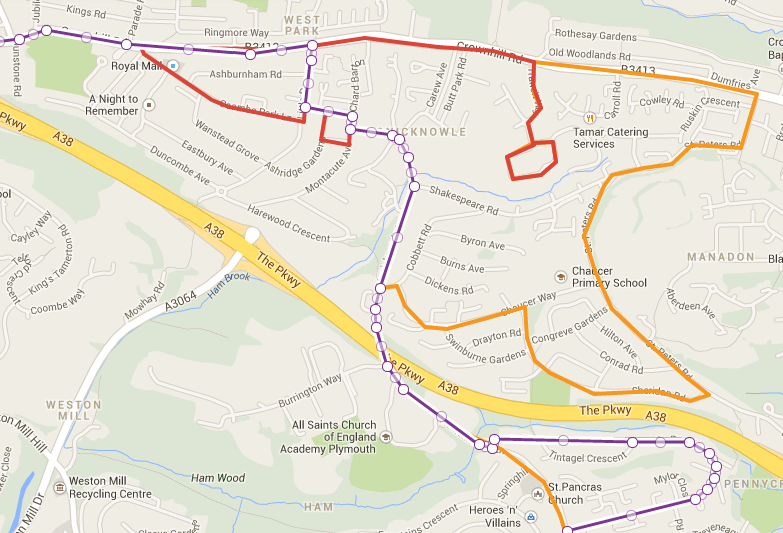 I'd really look to target Citybus' neglected areas, ie Eggbuckland and Tamerton Foliot mainly. Honicknowle (spelt wrongly in First's timetables!) and Brake Farm etc on the 61/62 are now reduced to every 30 minutes - and with it changing with the 43A horrendously unreliable! Posters are up all around the 61/62 routes at every bus stop advertising 'New service 3/3A is coming to this stop', so they really are serious about this one. It's also worth noting evening services in Eggbuckland are now down to an absolute bare minimum with the 28B - now it does Deer Park aswell it takes a very long time to get to Austin Crescent; speaking of which is now down to an hourly service as the 27A won't serve it. First wouldn't have to do much to win over passengers in Austin Crescent at least! Tamerton I think a fast route inbound via Looseleigh Lane and straight onto Crownhill - Outland Road - Milehouse - City without serving Derriford would prove popular. I hope that this is just the first phase of First's fight back im Plymouth. I agree with Anon @ 20:44, a route from the City Centre, through Mutley to Higher Compton, Austin Farm, Leigham, Estover and Derriford Hospital would be good competition for the 50 and the 27/28. These are areas that have been poorly served by PCB in recent years and this route would reinstall services to Delamere Road and I think be as quick for Estover if not quicker than the 50. Estover and Leigham also have similar demographics to Efford so plenty of fare paying passengers as opposed to concessions. I would certainly welcome the option as I will miss the 15 when it stops serving the area. Having said that the 50 is a reliable route these days and is very busy - something First never achieved with the 15 in this area. The 15 was always our bus of choice to town even though the 50 was slightly quicker - but only because I am an antisocial git and liked to have most of an empty bus to myself - as was usually the case on the 15. Frequent intervals is interpreted as every 10 to 12 minutes at the minimum. It permits First to slot in additional resource as they deem fit. 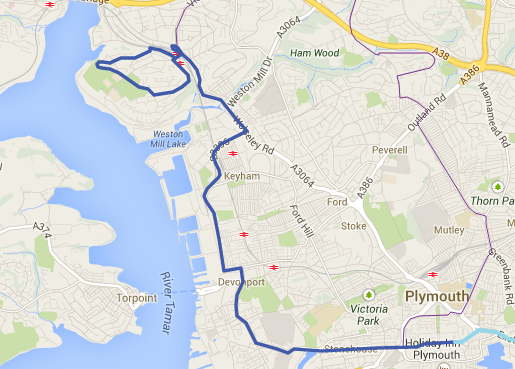 Who's gonna want to get on in west park and then go the scenic route through Devonport to the city? It may not take much longer if at all but going straight through the western corridor is what passengers are used too, honiknowle could Work but there will be passengers who remember the 11 and won't use it just in case (as we all expect) first will pull it in 6 months. Also I don't know the Times of the 61 /62 bit if they are half hourly that means a 15min service one way or the other I know in the 5 and 5a people simply cross the road for whichever comes first. Finally a LOT of Citybus passengers use the key so there may not actually be all that many people actually paying! I think you are missing the point. The odd passenger may travel to town etc from West Park via Devnport but most will use the conventional route via Honicknowle, Pennycross and Peverell, a route the new 3a offers. Firsts 20 minute frequency is better than Citybuses 30 min one in West Park, Honicknowle and St Pancras Ave where only the 61 currently serves. With good fares and better frequency First can make a success of this route as they did with the 11 a few years ago... believe you me they made a good profit on this route and won't pull out this time! It could be a torrid time for Citybus here where passengers are fed up with reduced and very unreliable Citybus service. first are really up for a fight now unlike 2009 when it was all half hearted. I am sure there wont be too many who want to go to the City Centre from Honicknowle via Devonport - but there will be those who want to go to Devonport from Honcknowle etc - the new route does open up new links which were not possible before without changing buses. This is what we need to see - less direct copies of existing routes - a bit more imagination! Anon re "With good fares and better frequency First can make a success of this route as they did with the 11 a few years ago... believe you me they made a good profit on this route and won't pull out this time... First are really up for a fight now unlike 2009 when it was all half hearted...."
I agree that they could and should be able to make a success of this route and it did seem to be a success last time round. I am not sure that you could describe the last effort as being half hearted though. With the full introduction of the Ugo branding on lots of buses, including quite a fleet on nearly new Volvo B7RLEs, lots of high quality printed publicity it was a major investment in effort and money. In fact it put this current effort to shame - buses being swapped between routes and recycled route branding for the new 6. Certainly 2009 was not half hearted - although they did quite quickly lose interest after the first year then it was downhill all the way. I am sure some will remember First's previous services not lasting but I dont think it will put passengers off too much although it might stop some buying long term season tickets. As you point out often casual passengers, especially free passes will just catch whoever get there first. As you point out a lot of regular passengers will be 'locked in' to one operator with their Key / First Card. This will keep a lot of people with First in Tavistock / Torpoint and many with Citybus within the city itself. The key to success will be if either company can succeed in getting passengers to switch their passes. This will not be easy! would certainly agree with you there! I am lucky in that my Freedom pass is allowed on all buses - it seems silly in this day and age that this is not possible for everyone. Sadly I cant see this happening for some time in Plymouth - certainly not in the current climate! Agree with both yourself and Graham here - this would be far more convenient even at an extra cost though what with the current competition between First and Citybus if it is to happen it won't be for a while yet! A very small point on the map - but I think the new First service will go round Honicknowle Green as it would otherwise miss out the stop. I can tell you that First purple 6 fare is £1 single any journey, any time on purple 6. Bye Bye Citybus in Efford I think...people would have to be stupid to pay Citybus fares. Hope they do nice promo on 3a too. People will not pay double for Citybus and they can not afford to match First who are ok to carry on making a loss for another 12 months whilst they damage Citybus and send them into a loss. Efford/Lipson £1 all round single fares on the 6, less than half the price of Citybus. 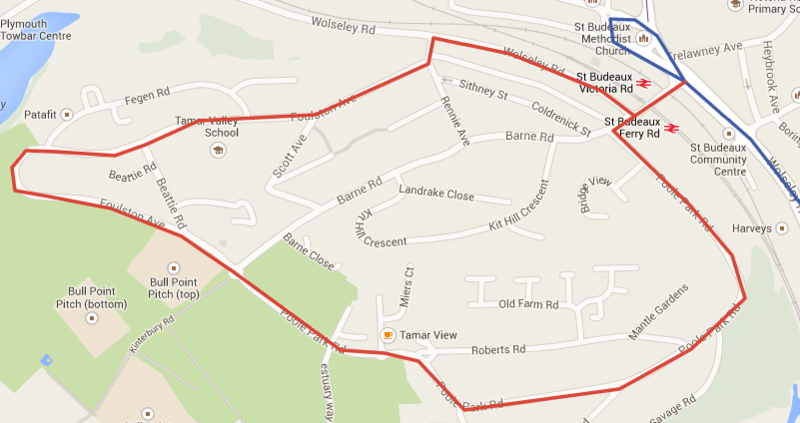 Driver told me today more new routes being planned in the city by First as well soon, once 3a and 6 bedded in. Alex Carter and First are geared up to give Citybus a harsh lesson. An awful lot depends on passengers who do not pay on the bus. I caught a 43 from St Budeaux this week and we followed a First 1 all the way. At each stop most passengers let First go by and waited for our, very full 43. Nearly all of them had the Key so were fixed in with Citybus. If First are going to hit back they will need to convince these passengers to switch cards - and that wont be easy. It works the other way round of course - Citybus will have to do the same at Tavistock and Torpoint. It might be cheaper to buy a First ticket - but the Key will get you to a lot more places within Plymouth at the moment. And also people do remember that First had all of these routes and then gave up leaving passengers in the lurch. Tavistock passengers will also be worried about switching to Citybus for the same reasons although they have so far stuck around on their additional routes. (still in Saltash, Ivybridge and Plymstock). Hopefully First's new services will go well. Plymouth needs a competitive bus network and it's good to see First opening up new routes in Honicknowle, Peverell and Efford. If all goes well I hope we will see a few more routes. How about extending the other 3's from St Budeaux to West Park, Transit Way, Brake Farm, Pennycross, Peverell, Mutley and City Centre as the 3B to take on the 62. This would provide a good link from Devonport and Keyham to Transit Way shops and be more frequent than the 62 to the city centre. Also the 1/1a could be extended to Mutley, Crownhill and Whitleigh at a 10 minute frequency opposed to the 44s 15 mins and reintroduce the 2 way loop around Whitleigh.